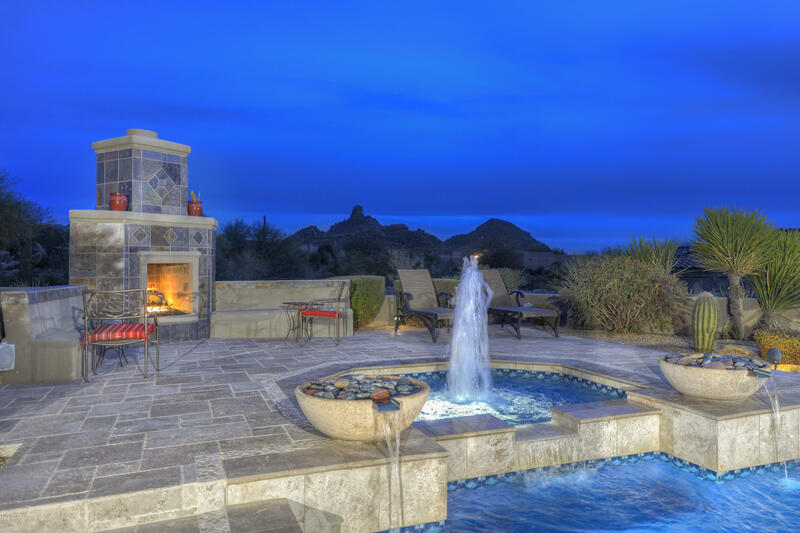 Panoramic Views of Pinnacle Peak, Mtns, Golf, City Lights & breath-taking AZ Sunsets from this private luxury Estate situated on .87 acres on the 2nd hole of the award winning Monument Course. Spacious 5 Bedroom/5.5 Baths plus Office & Bonus Room. Desirable N/S exposure. Gourmet Kitchen remodeled w/new cabinets, quartzite counter tops, breakfast bar & area, Wolf gas cooktop, Dacor dbl Ovens, Sub-Zero, Viking wine refrig, Scotsman icemaker. New porcelain wood-like tile floors. Kitchen open to Great Room w/gas fp, SS w/speakers in/out. Split Master w/fp, dual vanities, work out area. 1139 sq ft Guest House w/full kitchen, dining, living, 2 BR, 2 BA & laundry. Resort Backyard w/pool, spa, outdoor kitchen/bar, FP, built-in heaters & misters, 2 view decks, 5-car garage. A must see!